One of the most unusual flowers to grow is what is commonly known as Queen Ann Tears or Queen’s Tears. Other names for Billbergia nutans are Tartan Flower and Friendship Plant. The thin, strappy leaves of this bromeliad have quite sharp edges and the flowers hang down with showy pink bracts. The tubular flowers have navy blue or mauve petals, green base and bright yellow stamens. The best part is that it is so easy to grow and will propagate readily from offsets. There is a variegated variety available which is quite stunning. 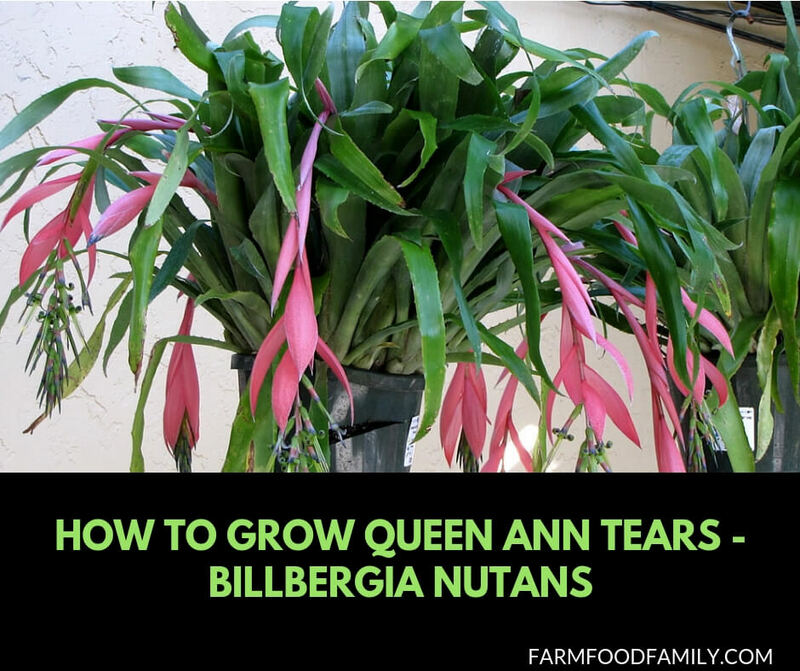 In cold climates Queen Ann Tears is usually grown as a pot plant on a sheltered patio or indoors where it needs plenty of light and even sun if possible. It should be potted into a mix that is light and sandy with lots of leaf mold. Epiphytic orchid mix is fine. In temperate climates it can be situated outdoors in the garden, or in a pot or the ground under a tree where it will get dappled sunlight. The potting mix is mainly there to act as a support for the plant, which derives its food from the liquid that forms in the base or vase of the leaves. It will last for ages in a pot without watering, especially if the weather is cool. In the summer when it is more active regular watering will see improved performance, although neglect does not seem to worry it overmuch. It will hold water in the leaf rosette and this is probably what saves it from dying of thirst. Any little shower of rain will be harvested for the best advantage. One way to grow Billbergia nutans is to wrap the roots in sphagnum moss and wedge it into the fork of a tree branch, or wire it to a bark slab, as can be done with other Bromeliads. The latter will make a really effective display if hung from a tree or patio. Since the flowers hang down, Queen Ann Tears would be delightful in a hanging basket. It seems to like having its roots squashed up in a pot, so does not require repotting for some years. Queen Ann Tears can also be grown out in the garden in temperate to sub tropical climates. Dappled shade is best, though it will acclimatize to sun and shade if it is in a sheltered spot. As mentioned, offsets form readily around the outside edge of the main plant. These should be left until they are at least on third as high as the parent plant. If taken before this, most will die. They should be potted up and may need support of a stake to keep them upright until their own roots are big enough to support them. It is possible to germinate seed, though not all plants appear to seed. If seed is saved, it should be planted on damp sphagnum moss that has been finely chopped. After planting, cover with a plastic bag or sheet of glass to seal in the moisture. Do not allow the container to be in direct sunlight until after the seeds have germinated and the glass or plastic can be removed. There are several different varieties of Queen’s tears and all are attractive. Once growing and flowering, this plant will give many years of enjoyment.